Looking for an affordable alternative to a 'throw away' OEM air filter? Never sure if you've put enough or too much oil on a re-useable aftermarket filter? These Uni Filters by Uniflow in Australia come assembled as a seperate foam filter medium and expanded steel mesh cage meaning the foam can be easily removed from the cage allowing you to clean and re-oil it easily. Because the foam comes seperate it can be properly soaked in the oil and properly wrung out to the right saturation too meaning you will have peace of mind that your filter is properly oiled and in the right condition to do its job properly. Uniflow produce polyurethane foam air filters which have excellent flow characteristics and filtration properties. Uniflow design air filters for Australian conditions where some of the finest dust particles in the world can be found (down to 1 micron in places which is equivalent to talcum powder!) and their air filters are used successfully by many professional racing outfits in Australia so they know a thing or two about keeping dirt out of your engine while letting it breathe! 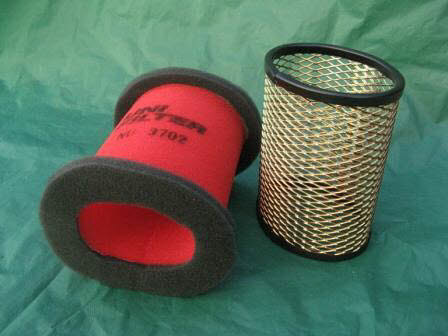 These Uni Filters are proudly designed and manufactured in Australia. Not to be confused with the US UniFilter which comes with the foam filter medium bonded to the cage making it much more difficult to get a consistent application of filter oil. Thunderbike will pre-oil the filter for you - The first oil is on us! Please note these do not fit the Commander/LT models. Looking for MORE torque and power? 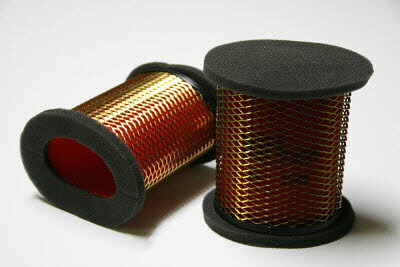 Check out our High Flow Air Intake + Uni Filter deal and save a few bucks to boot!